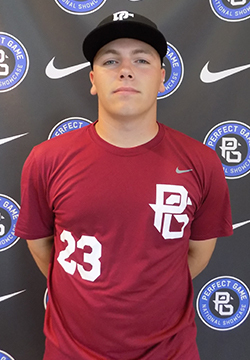 Nate Wohlgemuth is a 2020 RHP/OF with a 5-11 195 lb. frame from Owasso, OK who attends Owasso HS. Medium, athletic frame with broad shoulders and a strong, mature and physical build with plenty of strength proportioned throughout. Ran a 7.00 60-yard dash. Primary righthanded pitcher,simple delivery with a narrow leg lift up past belt, gets tall on backside and shows steady tempo throughout delivery. Repeats delivery well, quick arm through the back working to a three-quarters slot, high level arm strength and topped out at 93 mph, attacked hitters with fastball. Generates plane to fastball with life down in the zone, able to locate to glove side, maintained velocity well. Curveball shows nice bite with tight rotation and 11-5 shape up to 77 mph, feel improved and became consistent secondary. Flashed a changeup at 84 mph and will continue to develop a consistent release point. Good energy to actions in the outfielder, fields the ball out front and stays low throughout, excellent arm strength and comes early, big accuracy and carry out of hand. Righthanded hitter, shows a short and compact swing with quickness to hands and barrel. Pulls hands back at start of swing and utilizes a leg lift trigger for timing, incorporates physical strength in swing and shows carry off barrel with loft. Named to Junior National Top Prospect List. Very good student.